Shocking and enthralling, Alvarez’s masterful, visually stunning thriller maintains a frenzied pace to the last chilling minute. In Don’t Breathe writer-director Fede Alvarez goes for the jugular with an unapologetically brutal and twisted horror-thriller that pits a trio of thieves against an unexpectedly dangerous adversary. In this second feature film from Alvarez (Evil Dead) and legendary filmmaker Sam Raimi, a trio of friends breaks into the house of a blind recluse confident of an easy score only to find themselves in a terrifying life-or-death struggle. In 2013, writer and director Alvarez made his mark in the horror movie world with a bone-chilling reboot of Sam Raimi’s classic, Evil Dead. In his new film, Don’t Breathe , he explores different but equally terrifying territory in a shocking, suspense-driven tale. Alvarez once again joins forces with producers Raimi and Rob Tapert of Ghost House Pictures for a home- invasion story that blurs the line between horror and thriller. “It has elements of both,” says the director. In Don’t Breathe , three friends who commit a string of perfectly planned robberies decide to pull off one final heist when they hear about a blind man living alone in a deserted Detroit neighborhood. Raimi says Alvarez is not only a visionary director, but a consummate collaborator as well. “He possesses a rare combination of great storytelling instincts and the craftsmanship to execute his ideas,” says the prolific filmmaker, whose directing credits include the blockbuster Spider-Man trilogy as well as A Simple Plan, Drag Me to Hell, and the original Evil Dead Trilogy. Alvarez and his co-writer, Rodo Sayagues, set out to script a movie that was nail-bitingly suspenseful, but without an abundance of blood or gore. FEDE ALVAREZ (Director/Written by/Producer)Born in Montevideo in 1978, Fede Alvarez began making stop-motion films at the age of 7 using his father’s SuperVHS camera. At 29, he founded his own production and post-production company and produced and directed the You Tube short “Panic Attack!” about an alien invasion in his home city of Montevideo. The sci-fi short led to direct his first feature film debut – Sony Pictures’ re-imagining of the Sam Raimi classic Evil Dead, which went on to gross nearly $100 million worldwide. RODO SAYAGUES (Written by) is a promising newcomer to the Hollywood scene. 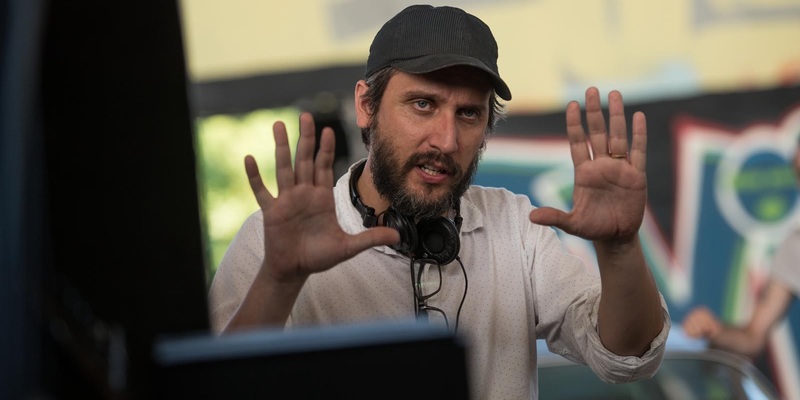 He has directed commercials in the Uruguayan market, receiving several awards, and teamed with director Fede Alvarez to make several award-winning short films. Sayagues was born and raised in Montevideo, Uruguay. His father, a prominent lawyer, and his mother, an English teacher, were always devoted to art and culture. They inspired their sons to appreciate classical and contemporary literature, music, theater and films. It was at a very early stage in life that Sayagues developed a passion for cinema and music. He developed his musical abilities first, studying classical guitar before moving on to modern music. Sayagues founded several rock 22 bands with which he played until early adulthood. It was during this period that he met his longtime creative partner Fede Alvarez and they started shooting homemade shorts with a VHS camera. Sayagues’ passions eventually mixed as he started shooting music videos for local rock bands. Over time he began shooting videos for more prominent Uruguayan artists. After graduating from film school Sayagues and Alvarez wrote a script called Corned Beef that earned them a scholarship at the Binger Institute in Amsterdam. While improving their script and attending screenwriting master classes, they hatched the idea for the short film Panic Attack!, which Alvarez would later direct. In November 2009 Panic Attack! became a huge sensation online and captured the attention of Hollywood heavyweights. Alvarez traveled to Los Angeles to sign a deal with acclaimed filmmaker and producer Sam Raimi. Sayagues relocated to Los Angeles soon thereafter and he and Alvarez have since co-written both the Evil Dead remake and Alvarez’s current thriller. Working with a co-writer with skills that complemented Alvarez’s was key to the creative process. The director estimates that he and Sayagues agree about 50 percent of the time. Alvarez’ collaborators all agree that the filmmaker gives every idea due consideration. “Because he is also the writer, he knows the beats of the story intimately,” says Hart. Tapert predicts Don’t Breathe will be recognized as one of the most suspenseful movies modern audiences have ever seen. “It is a thrill to see it with a whole theater of moviegoers sitting on the edge of their seats, literally holding their breath in anticipation,” he says.